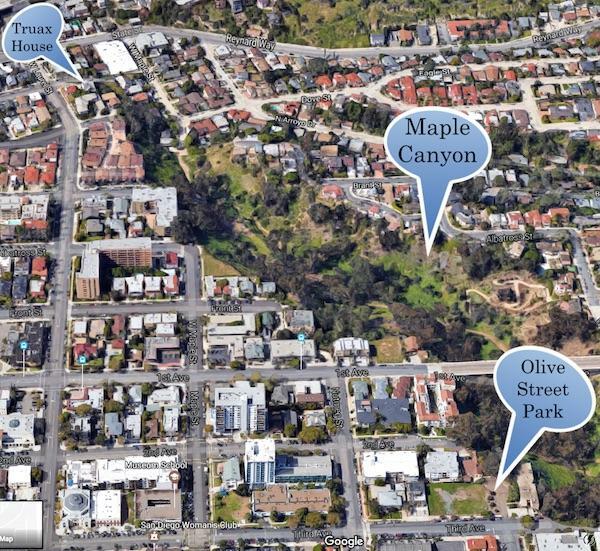 More than a century behind schedule, the Olive Street Park long sought on a small lot overlooking Maple Canyon in Bankers Hill has finally made it to the drawing board — but not without attracting controversy then and now. The lot, measuring 80 feet by 120 feet, was donated to the city in 1909 by the Ford, McKee and Woods families with the deed stipulating: “forever for use as a public park.” Except the proposed pocket park has yet to be built, much to the dismay of descendants of the three families as well as Bankers Hill residents. 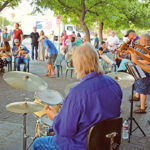 In the 10 decades that have passed since the lot’s donation, the property has been mostly used by a neighboring business as a parking lot — apparently with the city’s blessing — and has a driveway with a small roundabout next to the canyon. Today, the site is fenced off and the driveway is barricaded. 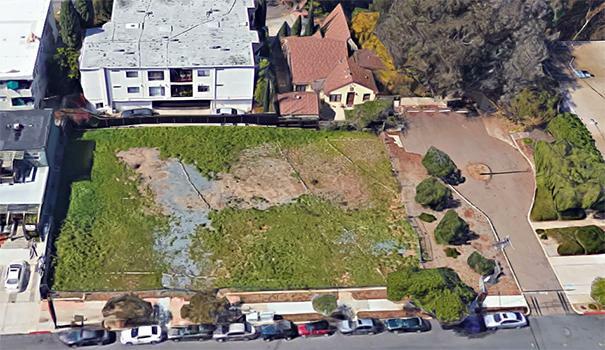 Back in 2004, the Uptown Planners noticed that the city had listed the lot as surplus property and set off warning flares to prevent the sale of a lot designated for parkland, which is scarce in Uptown outside of Balboa Park. Last year, Todd Gloria — in his final year as the District 3 Councilmember before his election to the state Assembly — spearheaded an effort to get the park built by suggesting that a proposed AIDS memorial — which would be a place for reflection and remembrance of the 8,000 San Diegans who have died from the disease — could be located on the site so that enough funding could be rounded up and the project could move forward. 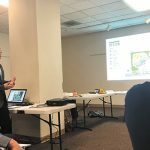 A public meeting on the proposed Olive Street Park was held by the Public Facilities Subcommittee of the Uptown Planners on April 20 in the Guild Room at St. Paul’s Cathedral. About 70 people showed up to watch and participate in a presentation by KTU+A, a landscape architecture firm in Hillcrest that is taking public input on what the pocket park should look like. The planning is now in the fourth of six stages, and KTU+A is taking public comments on several concepts. The lot is at the corner of Olive Street and Third Avenue, three blocks west of the West Mesa of Balboa Park. Third Avenue dead-ends just north of Olive Street, at Maple Canyon, which catches some motorists by surprise and requires a turnaround. This could pose safety concerns for park visitors. Then there is the Rheumatology Center of San Diego, located on the north side of the lot, which has access problems to the street. The structure was built on the edge of Maple Canyon on two sides. As a result, the project managers said, the building requires emergency access via the existing driveway. This would impact what could be constructed on the lot’s north side. Other than the Rheumatology Center, the rest of the surrounding buildings are residential. Some of the nearby residents said they are wary of building a pocket park that could become overrun by the homeless population. The flat side of the lot, along the west side of Third Avenue, is currently empty except for dirt and weeds. The back side, which includes land that extends into the top of the canyon, has two mature trees among six smaller ones around the driveway. KTU+A officials and the city’s project officer Kevin Oliver and associate engineer Yovanna Lewis discussed the concepts via a PowerPoint presentation, then took audience questions. • Liked: recreation areas, playgrounds, relaxation areas, native plantings, runoff basins, a tree grove, walking paths, and sculptures and public art. • Disliked: gathering spaces, a green wall, shade features, tables and a barbecue area. In 2016, the Bankers Hill Community Group (BHCG) submitted its priorities for the park: low-level landscape and pedestrian lighting instead of intrusive bright lights, walking paths, seating and picnic areas for the area’s older population, possibly some playground equipment if a need is shown, shade structure, shade trees, and attractive landscape plantings. The group opposed restroom and parking facilities since it would be a walk-to neighborhood park. Also, the group liked the idea of limited hours for off-leash dogs. Lastly, BHCG urged the city for help in providing park maintenance and enforcement of regulations regarding loitering, littering, noise and encampments. • Concept 1 would feature a large tot lot on the northeast corner, away from residential areas. It would have a picnic area, benches and a circular walkway. • Concept 2 would have a smaller tot lot in the same location with a picnic area, plus an AIDS memorial placed on the southeast corner. There would be a circular path and a large open space between the two main attractions. • Concept 3 would locate the AIDS memorial on the northeast corner, a picnic area, benches, open space and a circular pathway. Some of the concept images for the AIDS memorial included a memorial wall, paving stones with names and messages, and a series of small monuments. The AIDS memorial proves to be a controversial element in the design, according to comments from participants at the April 20 meeting. Susan Jester, a member of the San Diego AIDS Memorial Task Force, said the committee is adamantly opposed to the concept of a memorial wall. “What we don’t have in mind is a Vietnam Veterans Memorial Wall,” Jester said, referring to the large wall in Washington D.C. that is etched with the names of service members who died in the Vietnam War. She said the task force envisions a memorial that would fit in better within the community. “We see it more like ‘The Grove’ in San Francisco,” Jester said, referring to the National AIDS Memorial Grove in eastern Golden Gate Park. Go to aidsmemorial.org for images and more information. Task force members want the memorial to be near the edge of Maple Canyon, so it provides a natural place of “repose and reflection,” Jester said. 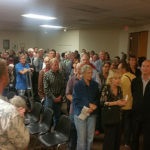 Some audience members oppose placing the AIDS memorial in the proposed park, saying it has no connection to the neighborhood. 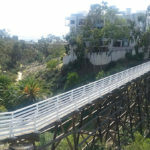 They said the logical choice would be in Balboa Park or at the historic Truax House — the city’s first AIDS hospice run by Dr. Brad Truax, a prominent gay physician and early AIDS pioneer — which is almost a mile away on the other end of Maple Canyon, located at 2513/2515 Union St. in Bankers Hill. Last year, the city sold the Truax House and an adjoining home for $2.5 million to the highest bidder: local developer Nakhshab Design & Development. The principal, Soheil Nakhshab, is a member of the Uptown Planners. According to District 3 Councilmember Chris Ward’s office, the property remains in escrow but the sale has yet to be completed. Nakhshab has promised to preserve and restore Truax House, and create a community meeting room in the building. Jester and Leo Wilson, chair of the Uptown Planners who helmed the discussion, explained the myriad hurdles necessary to get any monument placed in Balboa Park. They also pointed out the agreement to move the Olive Street Park proposal forward by pairing it with the AIDS memorial, and that convinced the city to push up construction of the park by years. Complicating matters is that the money from the sale of the Truax House property is legally required to be returned to the city’s gas tax fund and cannot be spent directly on the AIDS memorial. Mayor Kevin Faulconer — whose wife Katherine Stewart co-chairs the task force with LGBT activist Nicole Murray-Ramirez — vowed that his staff will find a way to redirect funding from other sources to match the $2.5 million expected to be made from the sale of the property. Audience members were divided over whether the AIDS memorial should be included in the park, much less sharing space with a large tot lot with a playground. The contrast between a place for “repose and reflection” and a place for energetic children to play bothered some people. A millennial woman stressed the need for a playground, although several people doubted the neighborhood’s demographics would show a need for a tot lot. Another woman pointed out another problem with building a playground: The park would have no restrooms, so where would the children relieve themselves? Some questioned whether an AIDS memorial would bring noise, traffic and parking problems for public events associated with the project. A number of people worried that the homeless population would overwhelm the park and create a security risk for the neighborhood. Most people supported the creation of an overlook onto Maple Canyon as well as a trail link. A man named Roy, who identified himself as gay, said he was OK with the AIDS memorial being at the park and as a member of the Friends of Maple Canyon he urged creating access to the canyon’s trails. “This is our last chance to get a trail into the canyon from this location,” he said. The concepts do not include access to the trail system, only suggesting to designate an area for a future link. One man said he has been living with AIDS for many years and that he is in favor of locating the memorial in Olive Street Park. And Peter Raymond, who said he knew the late Dr. Truax, urged including a link to the trail, which would lead back to the Truax House on the other end of the canyon. Without a link to the trail, another man said, there is no connection whatsoever to Truax House. By the end of spring or early summer, KTU+A expects to come up with a final schematic design for the park and plans to return this summer to the Uptown Planners for a third and final meeting on the matter. 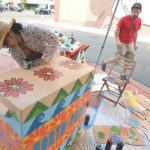 Soon after that, the project will then go to the city’s Park and Recreation Board for review. Thanks for shedding some light on this issue Ken! 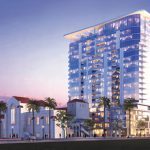 As a resident of Bankers Hill, it’s been an eyesore and I’ll be glad to see it improved. That being said, it seems a tad unnecessary to have a mini park that will almost assuredly become a dog poop park right across the street from one of the most amazing parks in the entire country! I think the space would be much better utilized as a community garden! There are many agencies in the community that could benefit from freshly grown donated produce. A great way to be more beneficial to the community that has suffered losses of loved ones from HIV and AIDS would be to use the produce to donate healthful meals to those in our community who are living with this disease currently. The memorial is a good idea in theory, but ultimately it’s hidden in a tiny neighborhood corner park as what will likely appear to be an afterthought. The community backlash reflects this opinion as well. – there are 2 nearby schools that are 1 block away that could learn about gardening and the health values of eating fruits and vegetables. Studies have shown that kids get excited about healthy food when they helped grow it! It’s a science, agriculture, health and community service classroom lesson all rolled into one! – there are many senior centers in the area and not a lot of activities for the folks who are living there within walking distance. A volunteer gardening club could help run the operations at the garden. Again, studies have shown (Robert Putnam -Harvard PhD, “Bowling Alone”) that being active in the community can ward off disease, depression and even premature death. Keeping our valuable senior community active and sharing their knowledge with a future generation of potential farmers is invaluable! These are just a couple of examples of how a community garden would be more beneficial to the community than a hidden memorial or a mini park. I know this is a late in the game suggestion, but hopefully the community agrees and we can make our voices heard at the next Uptown planning meeting!